Thousands of young athletes braved the cold outside while the competition heated up inside at the third preliminary meet of nation’s largest amateur track series for women, the 43rd annual Colgate Women’s Games. From Boston to Georgia, girls of all abilities from elementary school through college and beyond continued to improve, with many leaders now achieving nationally ranked scores. eNewsChannels NEWS: BROOKLYN, N.Y. — Pratt Institute — Thousands of young athletes braved the cold outside while the competition heated up inside at the third preliminary meet of nation’s largest amateur track series for women, the 43rd annual Colgate Women’s Games. From Boston to Georgia, girls of all abilities from elementary school through college and beyond continued to improve, with many leaders now achieving nationally ranked scores. On Friday in the High School division, Brooklyn High Jump champion My’khiyah Williams cleared 5’6″ for the win. Williams holds both the Mid School record of 5’6 1/2″ set in 2015, and the Elementary B record 4’9″ set in 2012. 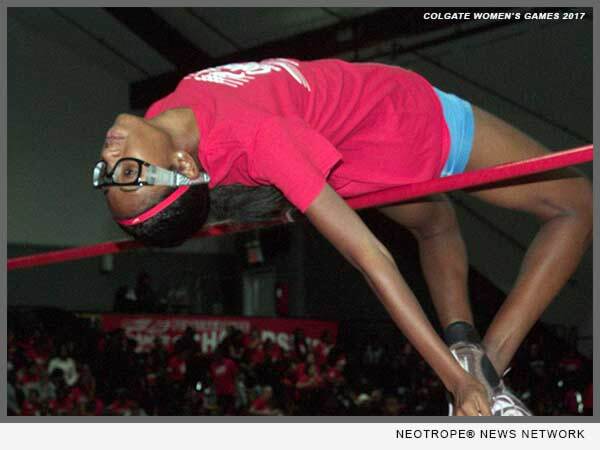 *Photo Caption: Brooklyn High Jump champion My’khiyah Williams cleared 5’6″ for the win in the High School division of the 43rd Annual Colgate Women’s Games at Pratt Institute on Friday. Williams holds both the Mid School record of 5’6 1/2″ set in 2015, and the Elementary B record 4’9″ set in 2012. Four preliminary meets and a semi-finals at Pratt Institute determine who will compete at the finals at The Armory, NYC in February for trophies and educational grants-in-aid from Colgate-Palmolive Company.